Are you preparing for the TOEIC® Test? Are you looking for extra support to help you pass the test with confidence? Written by experienced TOEIC® teachers, Cambridge Grammar and Vocabulary for the TOEIC® Test practices all the grammar and vocabulary you need to achieve a score of 700-850. Extra TOEIC® practice test sections mean you can perfect your technique before the real test. Audio recordings provide extra listening practice. Clearly explains all the grammar and vocabulary needed for TOEIC® at this level. 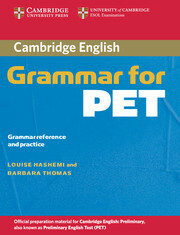 Presents grammar and vocabulary in realistic and meaningful contexts. Includes five TOEIC® practice test sections and a complete practice test online. 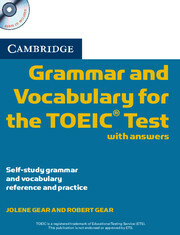 Practises the full range of TOEIC® tasks with useful tips on how to approach the test. Error warnings help you avoid common mistakes.